•	Celebrated architect Sir Basil Spence’s 1963 Lancia Flavia Vignale Convertible for auction. •	One of just 40 right-hand drive, UK examples made and recently restored to its original appearance. •	To be offered at auction at Salon Privé at Blenheim Palace on 2nd September 2017 with an estimate of £35,000 – £45,000. 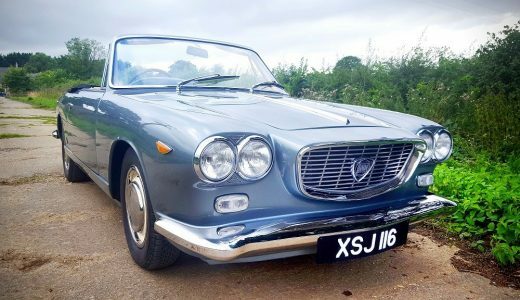 21st August 2017 – A 1963 Lancia Flavia Vignale Convertible first owned by celebrated architect Sir Basil Spence will be offered for sale by Silverstone Auctions at the prestigious Salon Privé Sale at Blenheim Palace on 2nd September. One of Britain’s most distinguished modern architects of the post war era, and most notably associated with Coventry cathedral, Sir Basil Spence is also known to have been a car enthusiast and purchased the Lancia Flavia Vignale in April 1963. 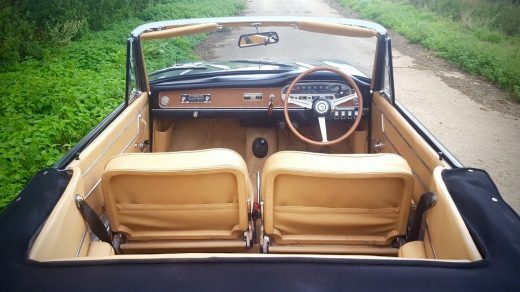 As one of approximately 40 right-hand drive, UK examples, the car was priced at £2,350, which was a considerable sum at the time. It is believed he bought the car as an appropriate gesture whilst he was working on his design for the British Embassy in Rome. Finished in Newmarket Grey, at the time the car wore Spence’s private number plate, BS 1066 (sadly not included in the sale), which was apparently the architect’s typically patriotic response to General De Gaulle’s block on allowing Britain into the EEC. However, it is believed that difficulties with the Italian planning authorities caused Sir Basil to dispose of the Lancia ‘in protest’ and replace it with a Jaguar, although exactly when is not clear. Now for sale with Warwickshire-based specialist auction house, Silverstone Auctions, the car has recently benefited from a full bare-metal respray carried out by Custom Motor Bodies of Birmingham, and returned its original hue of Newmarket Grey. It is expected to sell for £35,000 to £45,000 when it goes to auction in September. The Flavia comes with a restored and repainted factory hardtop, Biscuit leather interior with matching Wilton carpets, handsome wood rimmed steering wheel and original Motorola push button radio. “It’s a refined and practical four seater with a large boot, thoroughbred road manners, traditional Lancia quality and an exotic presence which is normally associated with much more highly strung and expensive Italian sports cars. With prices of Aurelia and Flaminia models now so strong, it’s hard to see why the Flavia Convertible won’t be heading the same way in the near future,” concludes Will. The car is accompanied by an extensive history file including the original Lancia Guarantee in Spence’s name (with his Canonbury Place, London N1 address) as well as more recent correspondence with the current Spence family. Also in the history file are a number of older MoT Certificates going back to the late seventies, which appear to support the recorded mileage of 51,604 miles. 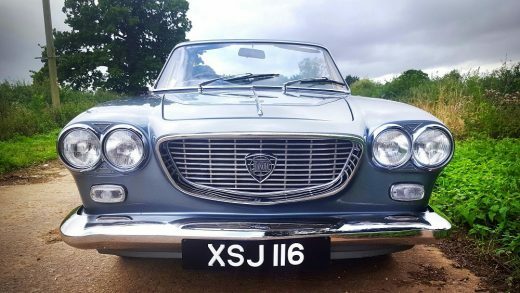 To find out more about the 1963 Lancia Flavia Vignale Convertible and Silverstone Auctions’ Salon Privé Sale, please visit https://www.silverstoneauctions.com/1963-lancia-flavia-vignale-convertible. 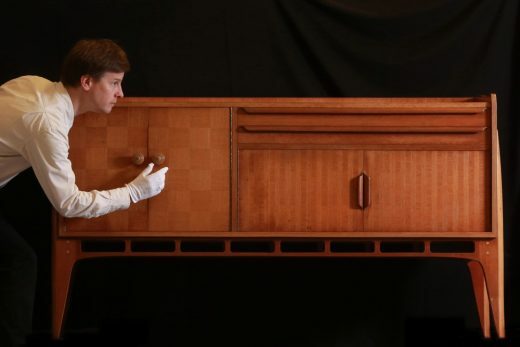 National Museums Scotland has acquired a rare example of furniture designed by Sir Basil Spence – one of the leading British architects of the 20th century – and manufactured by Glasgow firm H. Morris and Company around 1949. The modernist Allegro dining suite comprises a table, sideboard and six chairs, and will go on display from today in the Design for Living gallery at the National Museum of Scotland in Edinburgh. The acquisition has been made possible by generous funding from Art Fund. 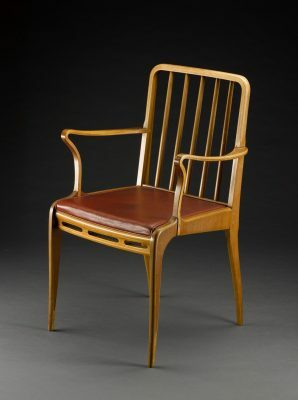 A landmark in post-war British furniture design, fewer than ten of the suites were made due to the substantial cost of the manufacturing process. In 1949, the Allegro dining suite was exhibited at Glasgow Today and Tomorrow at Glasgow’s Kelvin Hall and was awarded a diploma by the Council of Industrial Design. An example of the armchair was commissioned by the Museum of Modern Art, New York for their collection. The manufacture of the Allegro suite took inspiration from wartime innovation, specifically techniques of laminating and shaping wood to make strong and light helicopter blades. These blades were supplied by Morris of Glasgow which applied the same technology to furniture after the war. More than 100 layers of wood were bonded together before being shaped and carved. 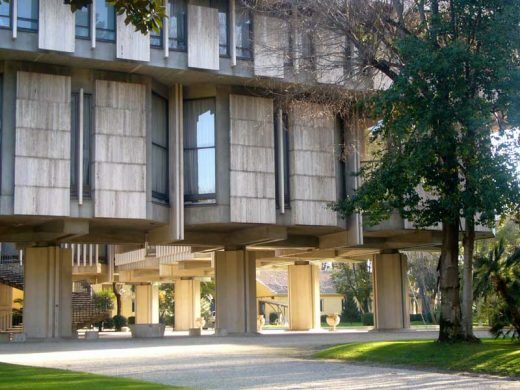 Sir Basil Spence was one of Scotland’s most recognised architects, responsible for the rebuilding of Coventry Cathedral, Hyde Park Cavalry Barracks, Glasgow Airport and the British Embassy in Rome. Spence co-ordinated several exhibitions including Enterprise Scotland at the then Royal Museum in Edinburgh in 1947 and made a major contribution to the Festival of Britain in 1951. H. Morris and Company was established in 1914 and specialised in fitting out hotels, cinemas and Clyde-built ships. During the 1930s they became innovators in timber lamination technology and design. Although born in India, Basil Spence was educated and spent much of his working life in Edinburgh (his father was Scottish). Before sttting up his own practice Basil Spence worked for Sir William Kininmonth (1904-88) at the practice of Rowand Anderson & Paul. Coventry Cathedral, England, is generally regarded as being Basil Spence’s most famous work. Landmark campanile adrift in suburbia. Assortment of white Corbusian buildings in rolling parkland setting: the crystalline chapel’s interior feels Scandinavian. refurbished by Duffy & Batt 2002-03. This 1950s Edinburgh house designed by Basil Spence was demolished in Aug 2004 just days before a Historic Scotland inspector was due to visit with a view to awarding listed building status. Conservationists were keen to see the two-storey house protected because it was designed by celebrated Edinburgh-based architect Sir Basil Spence. The City of Edinburgh Council gave permission for demolition of the modern house – deeming it a minor neo-vernacular work of Spence with major alterations – to make way for two new homes, with a planning application already submitted. The inspector from Historic Scotland reportedly only discovered the house in Whitehouse Road, Cramond, had been bulldozed less than an hour before his visit. City of Edinburgh Council chose not to impose a building preservation notice on the Cramond house, which would have given Historic Scotland six months to decide whether to list it. City of Edinburgh Council head of planning is set to meet Historic Scotland to discuss the case and the “under-listing” of modern buildings in Edinburgh. Including the Queen Elizabeth Square Shopping Centre. Initial designs in 1958 were for a five-storey building. The Erasmus Building became three-storey but remains controversial to this day as Cambridge’s ‘Backs’ – verdant green spaces along both sides of the River Cam – are not only picturesque but integral to most images of Cambridge, such as Kings College Chapel. It was the first Modernist building on the Backs. After Le Corbusier the Erasmus Building sits on stilts and includes a pergola on the roof, and includes the slit windows so popular in the 1960’s. Basil Spence was born in Bombay but was sent back to Scotland to study. He attended George Watson’s College in Edinburgh, then the architecture school at Heriot-Watt University, before completing his architectural studies at the Bartlett School of Architecture in London. Basil Spence’s started his career as an architecture assistant in the London office of Sir Edwin Lutyens. Basil Spence worked on designs for the Viceroy’s House in New Delhi, India and was heavily influenced by Lutyens. Spence then joined the London office of Rowand Anderson & Paul, where he worked with Sir William Kininmonth; Basil returned to Edinburgh in 1930. Spence served in the British Army from 1939-1945, reaching the rank of major. During the war, Coventry’s Anglican Cathedral had been almost completely destroyed during German bombing. In 1944, Sir Giles Gilbert Scott submitted a design proposal to rebuild the cathedral but this was rejected by the Royal Fine Arts Commission. In 1950, a competition was launched to find the most suitable design for the Coventry Cathedral rebuilding from a British Commonwealth architect. Basil Spence’s radical design was selected from over 200 entries. 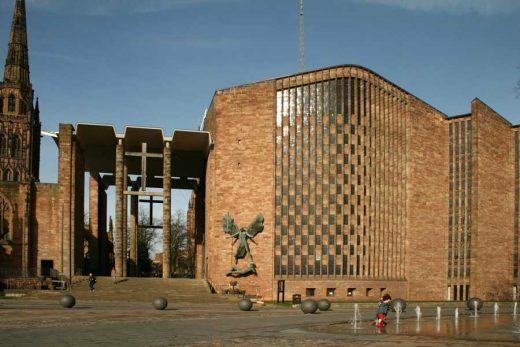 Work began on Coventry Cathedral in 1956 and the structure was completed in 1962. Spence was knighted in 1960 for his work at Coventry. Basil Spence served as Royal Institute of British Architects President 1958-1960. From 1961 to 1968, Basil Spence was Professor of Architecture at the Royal Academy, London. Sometimes compared with Robert Adam for his attention to detail, particularly in incorporating bespoke furniture and other elements into interior spaces, Spence died in 1976 in Eye, Suffolk and was buried at Thornham Parva, Suffolk. Public workshops encouraging people of all ages to learn more about the life and work of Sir Basil Spence, one of Scotland’s most celebrated architects. The first community workshop will take place at the Spence-designed Scottish Widows HQ in Edinburgh. This and the programme of workshops are designed not only to educate primary and secondary schoolchildren and community groups about Sir Basil Spence’s significant contribution to the profession, but also to address wider contemporary architectural challenges. The workshops form part of the Sir Basil Spence Archive Project, organised by The Royal Commission on the Ancient and Historical Monuments of Scotland (RCAHMS) and its partners The National Galleries of Scotland and The Lighthouse. The archive, held by RCAHMS, features almost 38,000 drawings, photographs and other documents detailing Spence’s long and distinguished career. The events will take place throughout the UK at a variety of sites designed by Spence, centred on venue-specific themes such as Travel, Worship and Education. Basil Spence is most famously associated with his radical designs for the rebuilding of Coventry Cathedral following its destruction by bombing during World War II, a project for which he received a knighthood in 1960. Renowned for his attention to detail, Spence was involved in a varied range of high-profile architectural projects, from Glasgow Airport, through Knightsbridge Barracks and the extension of the New Zealand Parliament buildings, to controversial designs for high-rise flats in the Gorbals area of Glasgow. The project has attracted over £1m in funding – £975k from the Heritage Lottery Fund, and £200k from the Scottish Executive. Over the next three years, RCAHMS will make an illustrated catalogue available through its online database and website. In addition, a major exhibition of the archive at the Dean Gallery and travelling showcase that will visit seven locations throughout the UK are planned, to coincide with Spence’s centenary in 2007. Rebecca Bailey, Head of Education and Outreach at RCAHMS said: “The workshops present a great opportunity to focus people’s attention on the buildings they inhabit and to encourage them to unleash their creativity with the help of professional designers and film-makers. We look forward to the creation of architectural models of office buildings, documentary films on housing, and innovative artworks, all inspired by the legacy of Sir Basil Spence. Sir Basil Spence retired in Malta and constructed a house in the Modernist style.